Stefan Kolesnikoff was born in the Ukraine to peasant parents and went on to study at the Odessa Institute of Art. 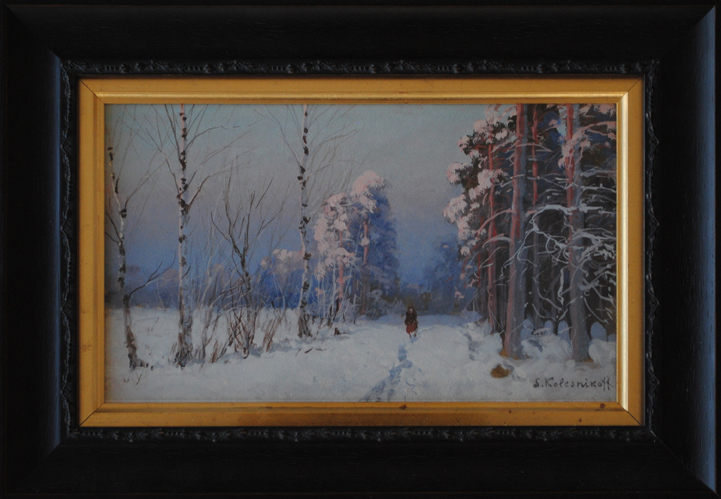 He was an artist of some renown, specialising in landscapes, particularly the difficult ‘Snowscapes’ in which he had few peers. He painted in gouache, watercolour and oil, producing work of the highest quality. In the 1920’s he moved to Serbia and became professor at the Belgrade Academy of Fine Arts where King Alexander of Serbia was a patron and supporter. His paintings are exhibited in Moscow, St Petersburg, Belgrade, Paris and Prague. His work features on a regular basis in Christie’s and Bonham’s and the Russian art specialist MacDougall’s, attaining figures into the tens of thousands.